Mark's Tickets is the best place to find tickets for Washington Nationals fans. Just check this page for any new events or schedule updates throughout the year. We sell tickets to every Washington Nationals game around the world. We know how passionate Washington Nationals fans can be about baseball, so we make sure to have hundreds of tickets for every game available right up until it starts. For those looking for cheap Washington Nationals tickets, we offer tickets starting at very low prices (many times below face value). 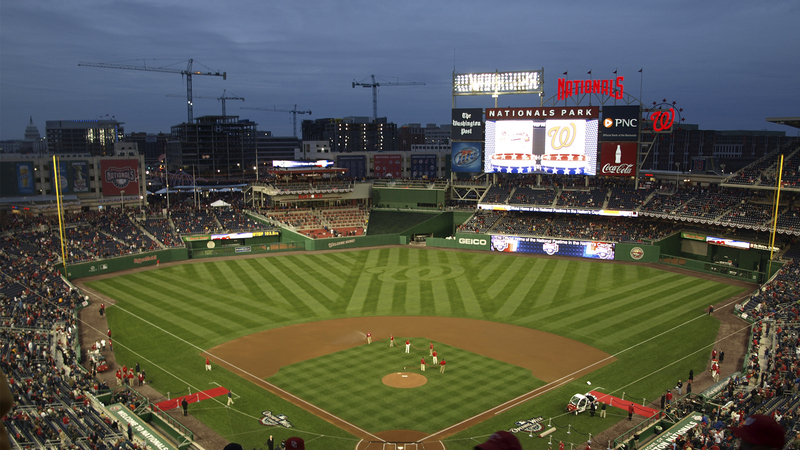 We offer tickets in most sections of every venue that you can see Washington Nationals. Simply choose the city or venue that you are interested in below, and you will be able to see all of the available seats. Do not forget that Marks Tickets also specializes in sold out Washington Nationals tickets. No longer will sold out shows prevent you from seeing Washington Nationals. The Washington Nationals are a professional baseball team that plays in the MLB. The Nationals play their home games at Nationals Park in Washington, D.C.. With 162 games per year, and 81 being home games, The Washington Nationals are a professional baseball team based in Washington, D.C. The Nationals are a member of the East Division of the National League of Major League Baseball (MLB). The team's home ballpark is Nationals Park, located on South Capitol Street in Southeast D.C., near the Anacostia River. The park opened in 2008, replacing RFK Stadium, the team's home from 2005 to 2007. The Nationals' name derives from the former Washington baseball team that had the same name (used interchangeably with Senators). Their nickname is "the Nats"—a shortened version that was also used by the old D.C. teams. The club had its highest winning percentage in the strike-shortened season of 1994, when the team had the best record in baseball. The team's subsequent shedding of players caused fan interest to drop off, and after the 2001 season, MLB considered revoking the team's franchise, along with either the Minnesota Twins or the Tampa Bay Devil Rays. After being purchased by MLB in 2002, the team was moved before the 2005 season to Washington and renamed the Nationals, the first relocation since the second Washington Senators moved to Arlington, Texas, and became the Texas Rangers in 1972.